I love having a laundry chute. When you don't see the dirty laundry you must not have any. However, when I rounded the corner in the basement this morning this is what I saw!!!! Ahhhh, shoot!!! What in the ##@@#@#@#** have I been doing???? O.k. you don't have to answer that!!!! No knitting today........well maybe a little during the Super Bowl!! Ahh! that's a bummer. Happy Laundry. My kids would probably try to throw themselves down the chute! There's always time for knitting! Thankfully my husband does all the laundry! 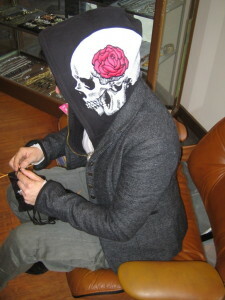 And I agree, there is always time to knit!! Happy SuperBowl! Oh, and the Endpaper Mitts look amazing!! HAHAHAHAHAHA that is too funny, I did laundry all night last night and this morning, I am sure you were doing what we have all been doing. In fact I got a chair from a neighbor(a big comfy one)& put it in the laundry room so I can sit & knit while I wait for the clothes to dry. 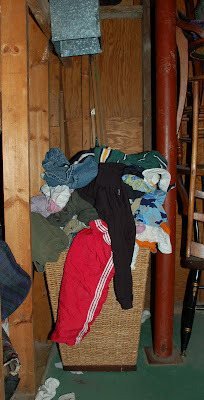 That's how my laundry basket looks like on weekends! mommy my feet are cold!